Before I begin: This article comes off a full strategy guide that we wrote a few months ago. The guide is a little over 30 pages long. This article is a condensed version of the guide. We tried to condense the article into the parts that mattered and removed the unnecessary items and the items that we used to drive a point home. This is going to be a long read, but I promise you that it’ll be well worth your time – especially if you’re trying to jump into the insurance investigations industry. For anything else, don’t hesitate to send us a message. In 2010, after working for a local company, I decided to jump off a cliff and assembled a plane on the way down. My goal was to get an insurance company account under my belt before I hit rock bottom. For two years straight, I knocked on attorney doors, e-mailed my way through three separate keyboards, and sought out mentorship from investigators in the industry. By 2012, I had a relatively solid understanding into how insurance companies worked. Around that same time, my company was acquired by a national firm where I was able to fine tune all of the things I learned on my own. It took a lot of work, but I eventually got to where I needed to be in my professional career. Today, my experience and understanding comes directly from working with a little over 300 different companies. I continue to learn new tricks from investigators across the United States, Canada, Mexico, Australia, etc. I continue to network with investigators and attend marketing conferences. I study marketing strategies from other industries and dissect the items that can assist and help our clients grow. I read everything from the craft beer industry marketing, to AIDA marketing models. In 2010, the question I was asking other investigators was “How can I get insurance clients?” Of course, no one was giving me any real information. I was their competitor. Most would give me the runaround – Go to conferences. Join associations. Knock on doors. Network. – those are great pointers, but they do not offer any real food on the table practical value. That same question is asked today almost 4 times per week; which is why I wrote this guide. What kind of clients you should be going after. How to find the clients that you need. How to prepare to make a sale. How to prepare your presentation. How to pitch your services. How to prepare for your first conference. By the end of this article, you should have enough information and the knowledge to hopefully get you a few clients. If you need help at any time, don’t hesitate to message us. You will need a website, you will need banners, brochures, business cards, presentation folders, report templates, and a sharp image. If you need help with any thing, that is where we come in. If you feel like you have everything in line, we hope this guide can push you in the right direction. There are four different sectors that you can target for insurance related work. One of them – National Insurance Companies – is irrelevant. The other three are Self-Insured Companies, Third Party Administrators, and Insurance Defense Attorneys. National Companies: (Irrelevant) When you talk about “Insurance Work” these are the companies that everyone knows about, but can’t get into their vendor’s list. We are talking about Liberty Mutual, Travelers Insurance, GEICO, The Hartford, MetLife, Etc. The reason I say they are irrelevant, is because they have contracts with national/international vendors – G4S, VRC, ICS Merrill, Global Options, Etc. Yes, I know that they sub-contract their work to small companies at pennies on the dollar, but these insurance companies simply don’t care. As a small agency, you simply do not have the resources or the man power needed to fulfill the needs of a national insurance agency. They have very rigid requirements that makes it close to impossible to qualify as an approved vendor. It is not about the quality of work, so don’t be offended when they turn you down. I believe that when it comes to investigation services, small companies crush national agencies. After speaking with former adjustors, insurance companies simply do not have the time to deal with hundreds of investigators across the United States. They would much rather deal with one national company to handle and manage subcontractors and payroll. Think about it, which would you rather pay – one bill to cover all your expenses, or multiple bills and risk missing a payment? The main benefit that national PI companies offer to Insurance Companies is the one stop shop benefit. So let’s not worry about the national companies. Instead, let’s focus on where the money is – (in my opinion). Self-Insured Companies: This is the top of the pyramid. These are the companies that generate so much revenue that they are able to cover their own insurance claims. They don’t need the assistance of a national insurance company to cover a claim. Some of the notable companies would be: Microsoft, Google, AT&T, Ace Hardware, Lowe’s, Etc. Here is a huge list of companies in Washington Alone: Self Insured List. Typically, a self-insured company will hire a retired or experienced insurance adjustor to work as a full time claims manager. Their job is to cover the insurance claims as they come in. These people are often called Risk Managers, Works Compensation Managers, Claims Analysists, Risk Analysis, Disability Program Managers, etc. Regardless of the title, just know that these people are the ones responsible for all the claims that come in and out of the company. They are hired to minimize worker’s compensation fraud and monetary losses. If the company is self-insured and they handle their own claims, the people listed above (Risk Managers, Claims Analysts) are going to be your primary points of contact. If a company does not want to handle their own claims, they still assign a person as the primary contact (usually the owner or a senior person) but they hire a third party administration company to handle the claims. If they hire a Third Party Administrator (TPA), the POC at the company has one job – to approve and decline the claims. They don’t really deal with investigators too much. But they are still the person that you must contact if you want to sell them on investigation services. With that being said, stop trying to get a hold of the manager, or the owner, or the president. They don’t have time to deal with your sales pitch. Instead, try to find the POC at the company that handles insurance claims, and arrange meetings (more on that in the next sections). Third Party Administrators (TPA): A third party administrator is usually an adjustor working for a small company that handles insurance claims for third parties. Usually, these companies are self-insured companies, but they can be Government Institutions, Cities, Local Governments, Groups, Associations, etc. TPAs are often times composed of small groups of insurance adjustors, risk managers, security officers, etc. Most of them are specialized in one particular industry or another. Whether it be transportation, energy, government, health, factory, etc. There are hundreds of TPA companies across the United States. New companies open up year after year, many get acquired and some go bankrupt. Nothing new here. These companies fight each other for contracts from the self-insured agencies, and some of the contracts they acquire are massive. One TPA can keep an investigator busy year round. The difference between a TPA and a national insurance company is that TPAs DO care about the quality of work and often times decide to work with small investigation agencies because they offer a better service and get that “personal touch”. You have to remember that TPAs work for self-insured companies. If your work is sub-par, they can very easily lose their contract to a different TPA. So as long as you keep offering top level results, the TPA company will continue to use you – you are only as good as your last case. If you screw up your case, this may be your first screw up, but the TPA may be on their last straw with the self-insured agency. Insurance Defense Attorneys (IDA): These are the people that defend self-insured companies when insurance fraud is detected. An insurance defense attorney is usually contracted by the self-insured company, but we have seen rare cases where the IDA is hired directly by the TPAs. The purpose of the IDA is to protect the company in court, and thus, it is rare for an IDA to contact you for surveillance service. You are going to be contacted for service of process assignments, witness locates, skip tracing, recorded statements and interviews, translations, or court record pulls. Daily Budget: The final piece of the puzzle. Most of the claims are assigned a daily budget by the self-insured. Let’s say that the daily budget for a claim is $5,000. The TPA takes that budget and hires a private investigator, nurse case manager, transportation services, pays for medical bills, and general bills for worker’s comp. This is the reason why TPAs prefer to work with investigators that give them daily flat fees rather than hourly rates. They have to budget out the full day, if you come to them with an $80 hourly rate, they have to guesstimate how many hours they need. I would suggest to give them a daily rate of $650 (average) to start off with. I have seen everything from $550 to $800 per day. The price is going to be up to you. Remember that a daily rate is going to cover everything: Mileage, Gas, Expenses, Report Writing Time, DVD Expenses, Shipping Costs, etc. The daily rate is an all inclusive price. TPAs HATE mileage and “additional expenses” so you have to include them into the daily rate. You’ll end up winning and come out ahead more often than not. Those are pretty much all the primary definitions you need to know. Anything else is just going to come from experience and working the field. Hopefully by now you are starting to see the puzzle come together. Since we’re located in the State of Texas, we are going to use our state as an example. This technique of tracking self-insured companies down can be used in any state of the union. Keep in mind that every state will have different rules, laws, and statues regarding self-insured companies. Most of the states have some sort of department that is in charged of the approved self-insured companies, our goal is to figure out what department handles this. 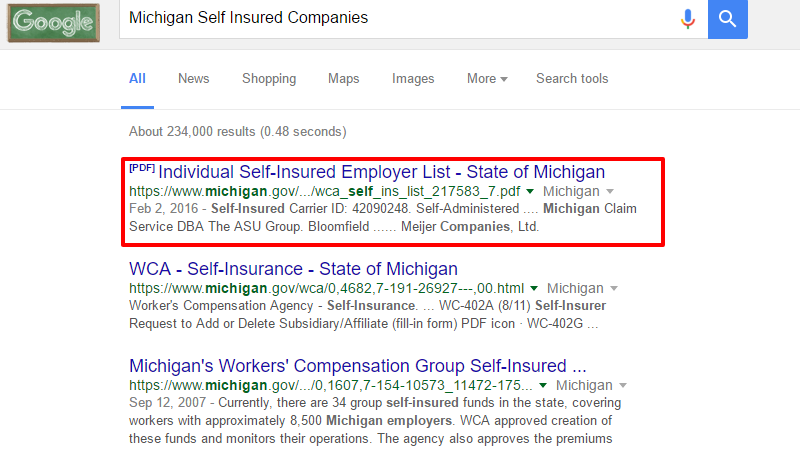 I’m not going to do this for every state, I just want to show you how you can find the self-insured companies for your particular state. 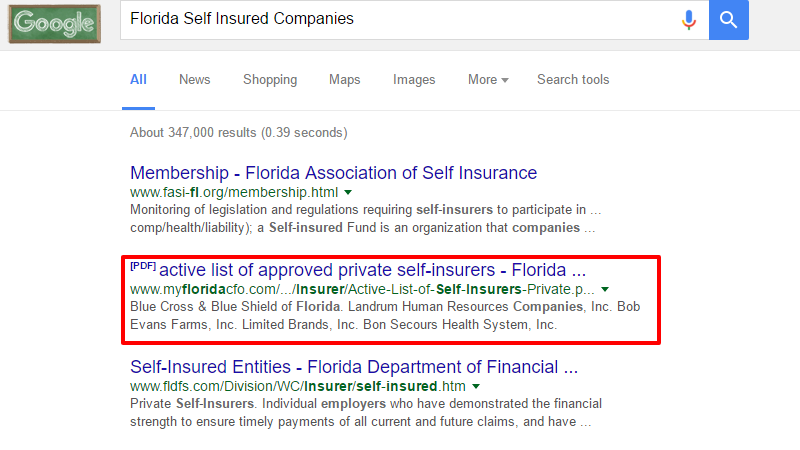 It really is that simple, you search for your state followed by “self insured companies” and you’ll find a list of self insured companies. Now, let us go back to Texas and keep on running through the example. 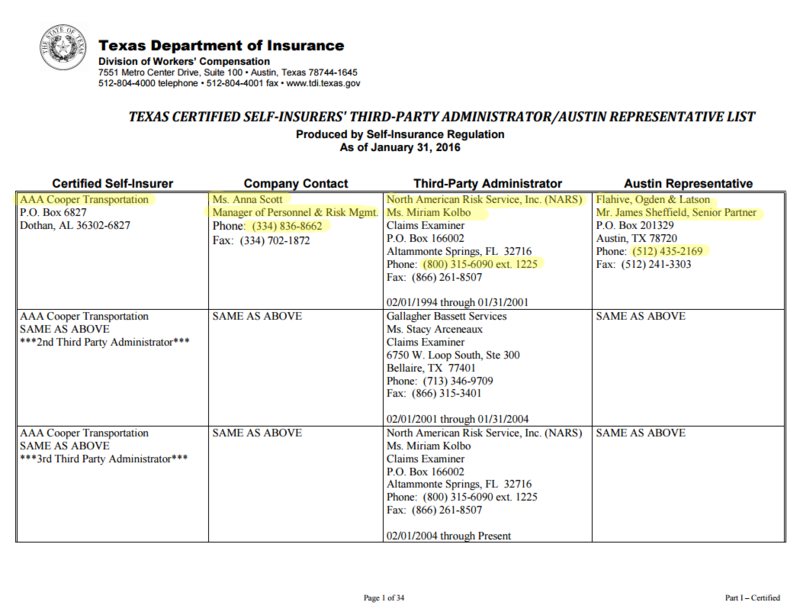 When we click on the list, we see exactly who the Certified Self-Insurer is (Self-Insured Company), who the company contact is, who they use as their TPA, and who their Insurance Defense Attorney is. This is pretty much all you need to start selling your services to these companies. We are going to discuss presentations, services, and how to research the companies in the next couple of sections, but you now have the starting bases to start your campaign and attract the clients you need. 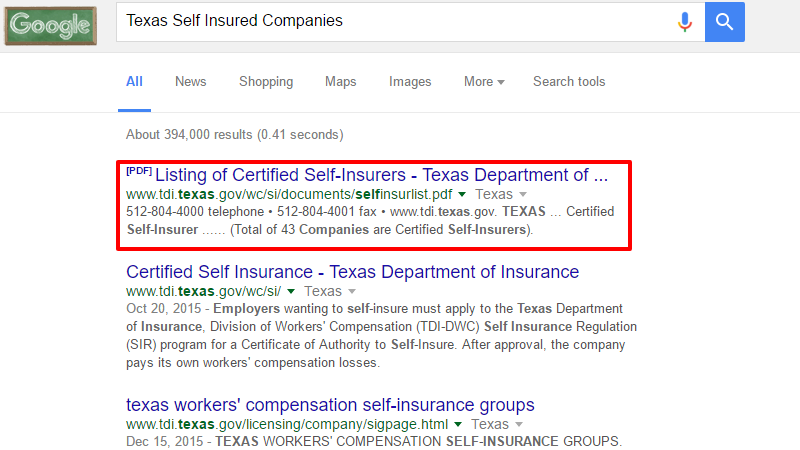 This is a screenshot of the Texas approved self-insured companies. You can also see that from 1994 to 2001, AAA Cooper Transportation was doing business with North American Risk Service, Inc. – the TPA. Sometime in 2001, they lost the contract to Gallagher Basset Services – a much larger TPA. 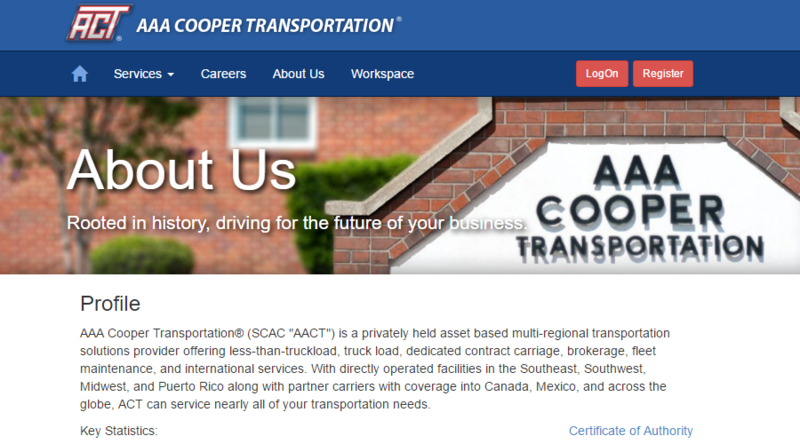 In 2004, AAA Cooper Transportation went back to using North American Risk Service, Inc. This is what I was talking about earlier. TPAs lose and win contracts throughout the year. This is why they are going to do business with reliable private investigative companies. The reason you are only as good as the last case, is because YOU may be screwing over the case for the first time, but the TPA company is probably on their last straw with the self-insured. So don’t think for one second that a TPA is going to give you multiple chances. On the list for the State of Texas, we find all the information that you’re looking for. Who your point of contact is at the self-insurer, who the point of contact is at the TPA’s office, and the name of the attorney that protects them when insurance fraud is detected. This is where most people blow it. We have given people strategy guides in the past where we list the full step by step process. Once they make it to the section where we show them how to find third party administrators, they throw out the rest of the guide and start e-mailing everyone on the list (like I did back in 2010) and ruin their chances for the future. Think of your sale process as a job interview. You need to sell yourself, and your company. The only way you are going to be successful is if you know who you are selling to. Don’t go knocking on my door to sell me a pair of shoes without a shoe catalog. At this point, I would recommend you create a check list to include company name, point of contact, services they offer, industry they specialize in, etc. If you have a CRM (Client Relationship Management System) use it here. You are going to want to fill it out with as much information as possible. The sales guide is going to help you understand who you are talking to, what they do, the services they offer, number of employees, and where they are located. The last thing you want to do is call your future client and stumble when you can’t remember where they’re located or what they do. 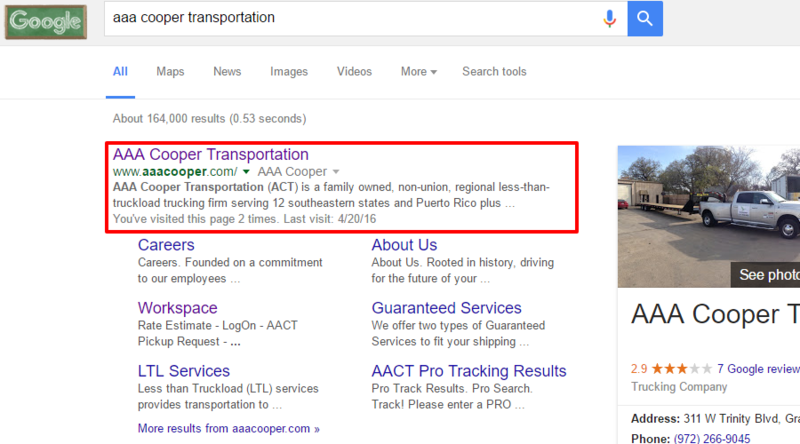 We are going to head back to Google and search for the Insured – AAA Cooper Transportation – We’re trying to find as much information as possible. Please note that this research was done in less than an hour. I am sure I could find more information if I had the time to break it down entirely. Going through their corporate website, we find that they have 6,000 trailers. They employ over 4,600 people and have over 12,000 dependents. We know that they are a transportation company based out of Alabama. They drive across the United States, but mainly specialize in transporting services across the south east. As we dig through the site, we need to start formulating a set of services that can help them. GPS Monitoring Services – to monitor cargo and shipments. Shipment Locator Services – Did they lose a shipment? What can you offer to them to help them track the shipment back to where it came from? Undercover Investigations – Employee Theft – Employee Surveillance, Etc. Notice that these services are geared towards the business and operations. Depending on the level of engagement from the point of contact, they may or may not be interested in insurance related investigations. Liability Investigations – if they are on the road, eventually they will suffer a motor vehicle accident. When that happens, our liability investigations can help them figure out who the truck crashed against. Did they crash against a person with bankruptcies? did they crash against a person with prior workers comp claims? A liability investigation is a sort of background check to help determine exactly what kind of liability they will have on their hands. Surveillance – We want to get involved as early as possible to prevent the claim from getting out of hand. This means doing quick surveillance on a claimant before they seek out the assistance of an attorney. You could offer several other services here, from witness locates to recorded statements. The point is, do your research into the company, and create a sales pitch geared towards them. Don’t be knocking on their door expecting them to use you because you’re a private investigator. They have enough investigators selling them on investigation services. You need to step up your game and really target your client. If they are not interested, no problem, we can contact the TPA and offer them insurance related investigations. The purpose of our research is to understand our client’s needs, pains, and ailments. The goal is to give them a solution to one of their problems. Whether that is corporate investigations, insurance defense, or background checks – offer them something. Think about what services you can offer your prospect. Write them down, and move on with your research. All together, the research should take you about 12 hours to complete. Let’s keep on moving on to the TPA’s website. We now know what the self-insured company does. Our job now is to figure out what kind of service the third party administrator provides. TPAs are like private investigators, not everyone is going to specialize in the same type of service. Some TPAs focus on offering service to help one particular industry. Other TPAs offer services to anyone with a check book. Our goal is to figure out exactly what kind of services they offer, and then create or modify our services to fit what they are looking for. Don’t go around offering “arson investigations” to a company that handles water damage claims. If you want to generate real revenue, you need to offer a service that is in high demand: Surveillance, Transpiration Deference, Liability Investigations, Background Checks, Recorded Statements, etc. Every company is going to have one pain or another. Figure out what that pain is, then solve it. We had a client offer “Farm Land Arson Investigations” to a transportation company in Florida. They loved the guy and promised to give him all the arson cases they get… which – to my knowledge – it has not happened yet. Keep your services relevant. Let’s start our TPA research. 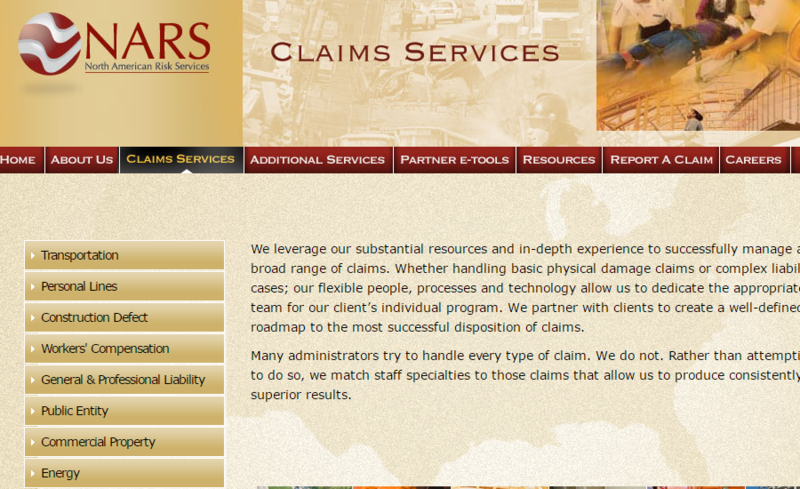 As we dig through the website, we found a section called “claims services” where they list out all the different types of industries hey service. From prior experience, I can tell that their primary industry is transportation. I know this from experience in working on website layouts. Usually, the top category (if it’s not in alphabetical order) is going to dictate what the company specializes in. It looks like they service several industries from construction defect, to energy claims, and commercial property claims. This is the information that we are going to use to build our service list. Again, we want to create or modify services that fit their needs and pains. We could offer: Surveillance, Trucking Defense, Liability Investigations, Transportation Protection Services, Witness Locates, Accident Scene Investigations, Recorded Statements, Etc. Whatever you decide, just make to verify this is a service they could truly use. 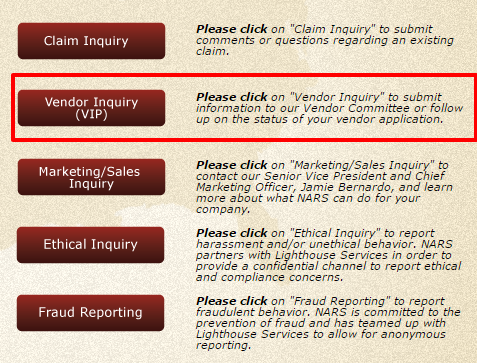 Most pages are going to have FAQs or pages dedicated to assisting vendors become approved vendors for their company. It simply does not get easier than that. You can literally e-mail them your company information and request to become an approved vendor. This is something that we identified in another company. 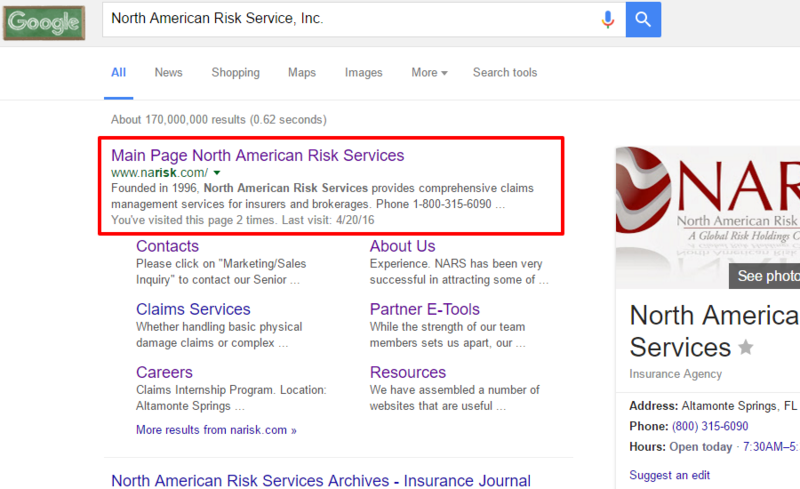 York Risk Services Group, Inc. They have a full page dedicated to open Contractor Opportunities. You can apply to become an approved contractor, and handle their work, from Premium Auditor Services, to Loss Control Consultant, and even Commercial Inspections. (They have a couple of hundred opportunities at the time of this write-up). Most of the companies that we found have pages open to help vendors and contractors to apply for the work you’re looking for. Your goal for this section is to find which companies have open contractor opportunities. These are going to be the easiest companies to target. I am not going to go into the full research of the attorney website, but you would do the same thing we have done up to this point. You need to visit their website, figure out what kind of industries they service, how long they have been in business, who the point of contact is, where they are located, and how many attorneys they have working for them. Multi attorney firms are going to be the hardest people to convince to use you. The larger the firm, the higher the number of companies that will be trying to get their work. Anyways, the point of this section is to get you to do research. You are going to spend more time researching the company you are going to be selling to, than you are going to spend sleeping, eating, or preparing your sales pitch. When it comes to selling to a company, you have two shots at this. Once during the phone or e-mail, and once during a conference meetup. So we’ve done the research, you’ve asked yourself all the possible questions and you have investigated all the possible scenarios, now it is just a matter of looking good. No one, and I mean NO ONE is going to take your word for it over the phone or via e-mail. Word of mouth is great when one adjuster or attorney is referring you out to other people, but when you are the person in charge of doing the sales, you need to look good. You are going to need solid proof that you know what you’re talking about and a very good and detailed presentation on who you are. TPAs, Self-Insured Companies, and Attorneys are flooded by sales calls, e-mails, and letters from people just like you who are asking for work. You need to stand out from the rest of the submissions if you want to have a fighting chance. Virtual Presence – This is your website, your e-mail presentation, and your social media accounts. Physical Presentation – This is going to be your brochure samples, presentation folders, flyers, banners, business cards, etc. Video Presentation – A quick snippet of video to show your prospects the type of work that you do. Sales Presentation – Do you actually sound like you know what you are talking about? The website is going to be the absolute first thing people will visit after you start your sales pitch. If you are going to cut corners on your marketing and sales campaign, the website is not the corner to cut. TPAs will pay you upwards of $650 per day per surveillance, make sure that you invest a healthy budget reserved for your online presentation – it’s all about the perception that you give your clients. How much is $650 per day worth to you? Think about the value that your website and sales pitch will bring to our company. I’m not saying this because we build websites. You don’t have to use our company, you can use any reputable website design agency, just make sure your website sells your services to your clients and looks good. When it comes to website design, you need to make sure that your website clearly identifies who you are and what you do. Your website does not need to have all the bells and whistles, instead, it needs to have the elements that are going to work for what you need. Whether it is converting TPAs, Insurance Defense Attorneys, or Self Insured Companies. You don’t need a “cool” looking website, but you do need a website that is going to look on-brand, work smoothly, and allow insurance adjustors find what they are looking for – then get them to do what you want them to do. You also need to understand that Insurance Adjustors are not going to be searching for your company. They’ll go to your website once you tell them to visit your page. Either via e-mail, or when you provide them with a Flyer or Brochure. Your website is not going to automatically convert people, but it will help you build trust. At the end of the day, the whole point of the website is to help convince your clients that you know what you’re talking about. You don’t need crazy marketing schemes, or flashy styling. Just give them what they need and provide them with results. And finally, don’t confuse your Insurance/Corporate Website with a Domestic/Infidelity Website. They are two completely different animals that require two different types of writing, designs, and layout techniques. ** Quick Tip: If your website does not look better or at least as impressive as the client you are going after, they’re not going to call you back. Make sure that your website is on point. You will not believe the number of sales our company missed by targeting clients with much larger and better looking websites than ours. It’s 2016, they do judge a company by their website. If you don’t have a website, consider using one of our Starter Websites to help you get started in 48 hours or less. If you claim that you offer “world wide” or “national services” but have a 5 page website, that is the equivalent of going to “World Wide Stays Hotel” and it only has 5 bedrooms. It simply does not make sense. Take a look at Kroll.com if you want to see a world wide style website. Please make sure that you have professional e-mail addresses. 007JohntheSpy@aol.com is not going to cut it. Professional e-mails are not expensive. They will run $12/Month for several hundred addresses. his can make or break your sales pitch. Reputable companies are ones that have professional e-mail addresses followed by professional signature lines. Who would you trust more with your money? – Sales@bank-name.com or BankName@aol.com? Why would anyone trust you with a similar address? We’re not going to worry about Social Media Presentation, even though that is more important today than ever. We simply don’t have the time to go over all the ways you can use Social Media. We wrote a strategy in the past that we include with all of our document downloads. In short, your Social Media needs to be filled with news and articles about the industry. Don’t post a status update that says “Please contact us for your investigation needs.” – what’s the point? No one is going to share it or start a conversation from that. If you post articles on how to stay safe or how to protect your company/business from fraud, people are more inclined to share and initiate a conversation that way. Prior to contacting your prospects, you need to make sure that you have all of your T’s crossed and your I’s dotted. This means having a professional presentation folder. Take a look at what we did for Womack Consulting and investigations. In short, the presentation folder helps you present your company to your clients. That’s it. So you have to make sure that your folder looks professional and presents your company as an authority in the industry. When you e-mail a client, you’ll be asked to provide them with some “material” so they can pass it along to their superiors (your presentation folder is the material). You’re going to want to include your price sheet, usually, TPA’s and Self-Insured companies like to work with daily rates. About $650 per day (average). They work on flat rates because their cases usually have daily budgets. $5,000 daily budget to cover transportation, surveillance, legal fees, nurse case managers, etc. Giving them a daily rate allows the client to manage their claim better than giving them an hourly rate and an “estimate” that can be a hit or miss. Most TPA’s and Self Insured Companies attend conferences throughout the year. Here is one: http://www.siia.org/ the purpose of the conference is to help the members keep up with laws and regulations. What you do, is pay for a booth at these locations. The rates can go from $800 – $2,500 per booth depending on the conference that you are attending. This is where most of your “connections and networking” happen. Make sure that you spend good money on the quality of print jobs for these materials. I understand that Vista Print is cheap and affordable, but the quality of printing is no where near acceptable. Your competitors use local printers and have very high resolution images. Work with a local printing company and spend the extra money on high resolution banners. You will literally be standing next to your competitors. You need to “out shine” their marketing efforts. Reserve your conference spot early: Most of the conferences sell their booths on the “first come first serve” basis. So you want to reserve your booth on high traffic areas. Figure out if your conference requires you to add them to your general liability insurance. Staff your booth with knowledgeable staff that is prepared to answer all questions. Buy supplies: Booth Flooring to cover up ugly carpets, comfortable shoes, give away items, swag to give away, packing tape to pack-up items when you’re done, pens, etc. Lastly, understand that a full conference even will cost you in ball park range of $3,500 after it’s all said and done. The results will take several months before you see the full results from the conference. With that being said, don’t just attend one conference and wait for the results before you attend the next one. If you do this, you will run into feast or famine patterns. You need to ALWAYS be selling. Prior to going out to the conference or on a sales run, make sure that you make a short video with the best footage. Blur our the subject’s faces and show off your video quality. You want to make sure the video is properly edited, don’t just slap it on a Windows Movie Maker and call it a day. Actually make sure you do a good video presentation of your work. This is your call card. Know what you’re selling. That’s what this comes down to. Know who you are talking to. Know what they do. Know who they are and please know the name of their company. We have people that contact us on the monthly basis to sell us services that we don’t need. Be prepared to answer hard questions – intelligently. Practice with someone prior to calling your client. You know your stuff, I know 100% that you understand your business and industry inside out, but it never fails – a client will ask you a question that makes no sense whatsoever, but you can’t call them out so you have to answer the question in such a way that you look competent. If this is an in-person presentation, make sure you have rehearsed your sales pitch. If this is over the phone, make sure that you have a sales guide in front of you so you can refer back to it when you’re talking to the client. Have their name, company services, and a list of services you plan on offering to them. This is pretty much all you need when it comes to your presentation. Insurance clients are the hardest type of clients that you will ever get, but they pay very well and can help your company grow in a matter of months. They’re not impossible to find and not difficult to reach, but you do have to prepare your company and yourself. We have received hundreds of questions and several comments from people telling us “We opened a website, but it doesn’t work because we’re not getting clients”. Websites are not the problem, and neither are your services. The problem is that without marketing your services the right way, your company will not survive. If you wan to acquire clients that will pay you $650 per day every day, you need to sell to those people directly. Make sure you do your research on your clients. Make sure you look good BEFORE you contact them. Make sure you sound intelligent AFTER you contact them. And understand that TPAs may not need you this month because they are using a PI company, but they may need you the month after when the PI company fails to give them the results they need.